Well the royal wedding of Prince Harry and Meghan Markle has come and gone and the young couple are now styled as the Duke and Duchess of Sussex. 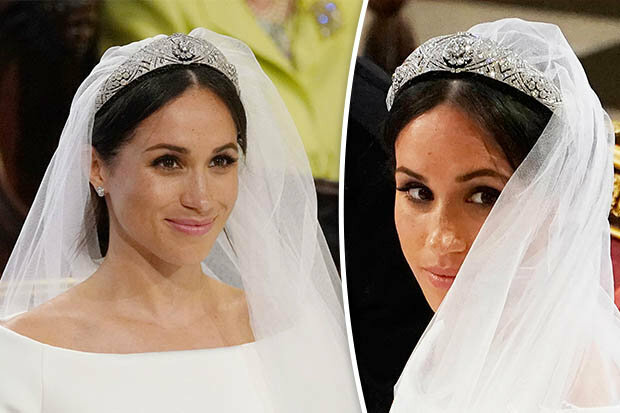 I have to say my guess as to what tiara she would don for the big day was way off, but I was not alone as the tiara selected had not been seen publicly in nearly seventy years. I present Queen Mary's Diamond Bandeau Tiara (formerly known to royal watchers as the filigree tiara). The tiara was loaned by the Queen and is a high art deco stunner. It was commissioned by Queen Mary in 1932 and is centered by a Victorian diamond rose brooch that Queen Mary received as a wedding gift from the County of Lincoln in 1893. 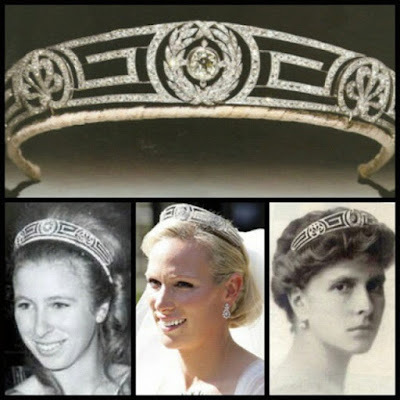 The tiara is divided into eleven flexible sections with an overall geometric pattern of interlacing arcs. The tiara was seen publicly at a few events up through the late 1940s and then it passed to Queen Elizabeth II upon Queen Mary's death in 1953 and disappeared from view. 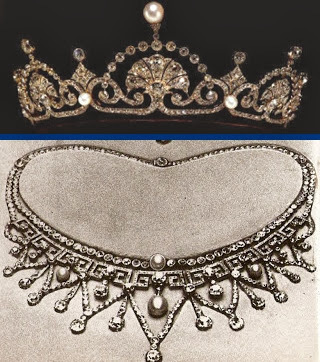 While it has been stated that the tiara was designed to accommodate the the County of Lincoln brooch, you can see from the period images Queen Mary was wearing it with a different central stone. 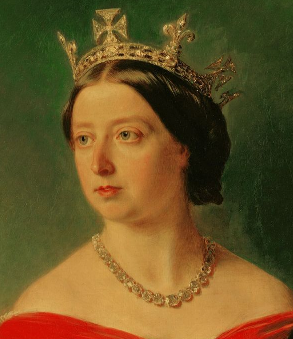 Queen Mary loved versatility with her jewels and often had pieces that could be worn a number of ways and with different configurations of stones. 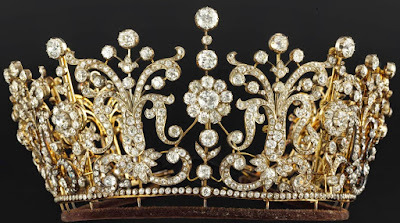 When a royal jewel such as this falls out of use there is the worry/assumption that it may have been dismantled for the creation of another piece. It is for this reason none of the most skilled royal watchers had this tiara in the running on their prediction lists. The use of a sleek and modern tiara seems to be a growing trend among royal brides which is fitting given the simplified clean lines preferred by contemporary brides. It is a far cry from the romantic, historicist and opulent trends preferred in fashion and the decorative arts of the go-go 1980s and 90s. The Duchess of Cambridge borrowed the Queen Mother's Cartier Halo art deco tiara for her nuptials to Prince William in 2011 with great effect. Similarly, Princess Anne's daughter, Zara Phillips wore the starkly modern Meander Tiara for her 2011 wedding to Mike Tindall. While technically not art deco this Edwardian neoclassical bandeau has a chic austerity and a low profile perfect for a contemporary bride. 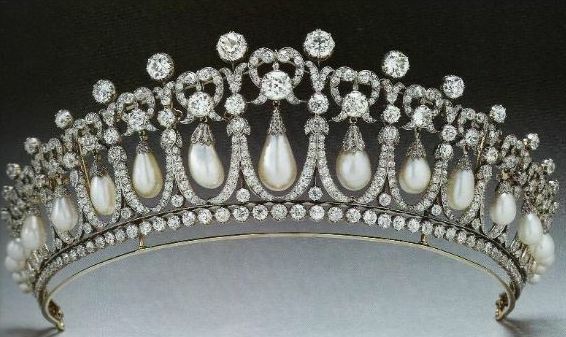 The Meader Tiara dates to the turn of the century and belonged to Princess Andrew of Greece, Prince Phillips mother and was given to Queen Elizabeth II as a wedding present. In turn, it was given to Princess Anne in 1972 in whose possession it remains. There you have it. A few questions remain. Is it a lifetime loan? Will the Duchess of Sussex have access to other pieces as needed? Only time till tell. I have long neglected this blog but as the nuptials of Prince Harry and our Miss Meghan Markle are upon us I thought I would chime-in regarding the possible tiara she may wear on the big day. 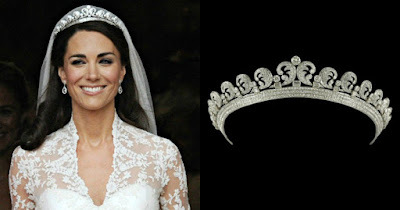 The post regarding the wedding tiara for the Duchess of Cambridge remains my most read post to date. I am motivated to write due to the vast amount of sensational and incorrect information that is floating about. The majority of news outlets on both sides of the Atlantic are putting forth tiaras that are now more closely associated with the Duchess of Cambridge and I believe this to be an obvious oversight. Namely the Cambridge Lover's Knot and the Queen Mother's Lotus Flower tiara. 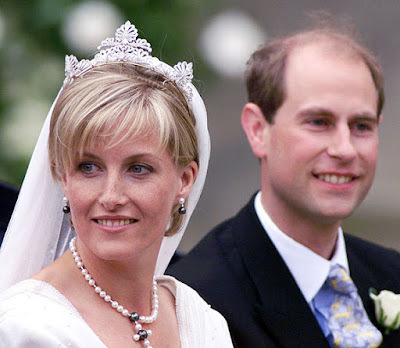 As we know, the Lover's Knot is most closely associated with Princess Diana but it has a deeper history. 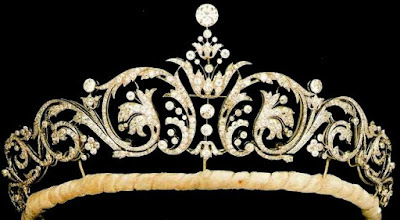 It was commissioned in 1914 by Queen Mary who, in a nostalgic vein, wanted to recreate the lover's knot tiara that belonged to her grandmother, Princess Augusta of Hesse. Originally each knot was surmounted by an oval pearl to mirror each drop below but by 1935 it was simplified to its present form. Queen Mary passed it to her granddaughter Queen Elizabeth II who in turn presented it to Diana upon the occasion of her marriage to Prince Charles. Most recently it has been worn to state events by the Duchess of Cambridge which is why I feel it would be a misstep to have it as a centerpiece of Miss Markle's big day. I have similar thoughts regarding the Queen Mother's Lotus Flower Tiara. 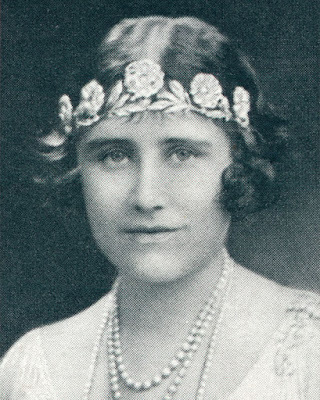 Also known as the Papyrus Tiara, it was fashioned from a necklace that was given to The Queen Mother on the occasion of her wedding to Prince Albert (later George VI) in 1923. 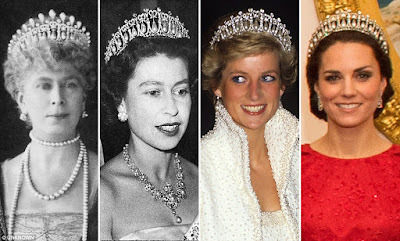 The Queen Mother loaned the tiara to Princess Margaret and it became a fixture in her repertoire. Princess Margaret in turn loaned the tiara to her daughter-in-law Serena Stanhope on the occasion of her marriage to Viscount David Linley. The fact that the Lotus Flower has been regularly loaned to the Duchess of Cambridge has solved an age old mystery. It was long assumed that the Queen mother likely gave the Lotus Flower to Princess Margaret outright, but it is now clear that is was a lifetime loan and was returned to the royal vaults after the Princess' death in 2002 and thus falls under the purview of Queen Elizabeth II. Again, since the Lotus Flower has been loaned to the Duchess of Cambridge for recent state functions it would lack special significance for Miss Markle's wedding. 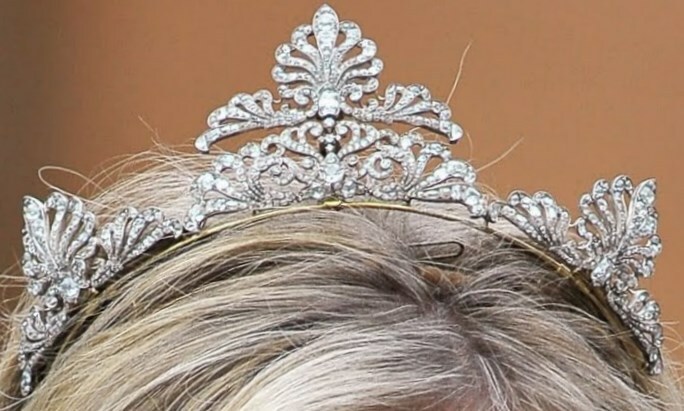 Time Magazine, as well as other outlets, has put forth the Spencer Tiara as a candidate as it would be a sentimental nod to Princess Diana who wore it on her wedding day to Prince Charles in 1981. 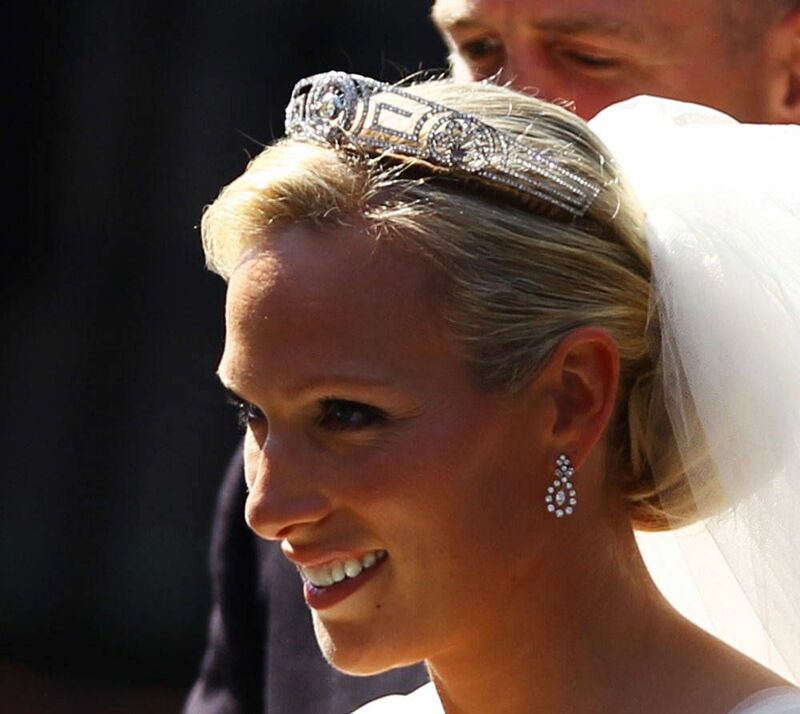 The tiara is a historic piece from the Spencer family and was worn at the weddings of both of Diana's older sisters and by her sister-in-law Victoria Aitken. 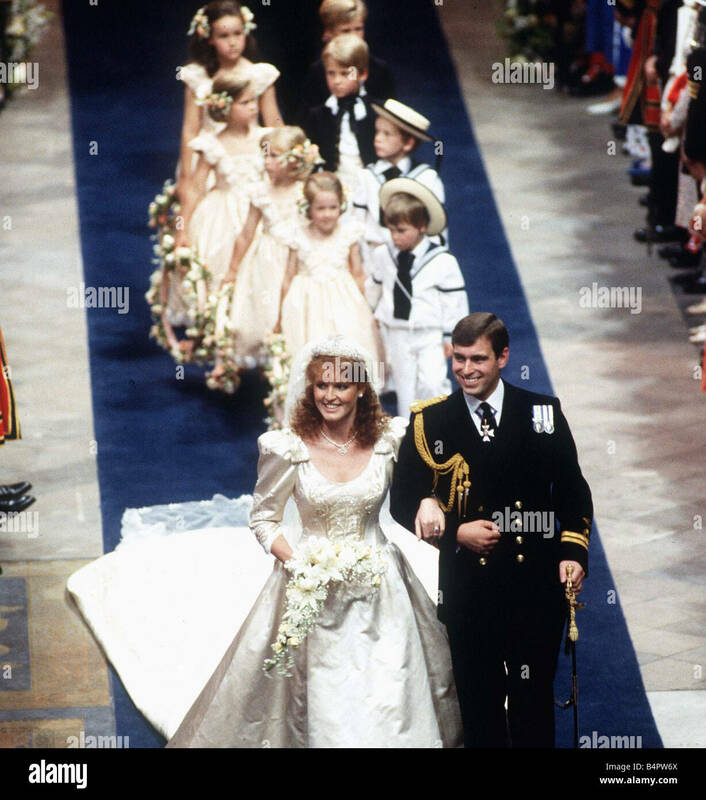 It has seen many a wedding, which in itself is not such a bad thing but it is the property of Princess Diana's brother, Charles the 9th Earl Spencer which could add a wrinkle. Since it is the 9th Earl's property the royal couple and the British Royal Family would have no control over its later use and exhibition which could prove unseemly. In addition, the 9th Earl has five daughters of his own who will likely lay claim to use of the tiara for their respective wedding days down the road. Since the Duke and Duchess of Cambridge's union and subsequent children, Prince Harry and Meghan Markle will not be "main line" royals in the strictest sense. Meaning there is little likelihood that Prince Harry would ever been King. 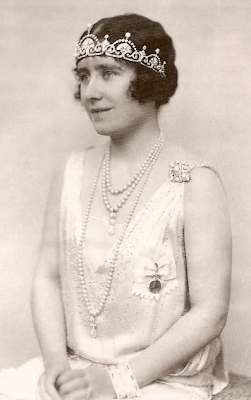 The Queen Mother and especially Queen Elizabeth II have been very forward thinking about the core collection of jewels, consolidating them for the working Royals of the main line, making loans of some pieces and purchasing others as outright gifts, thus ensuring that historic pieces will remain for the use of the current monarch. Such was the case when Princess Margaret wed Anthony Armstong-Jones in 1960. 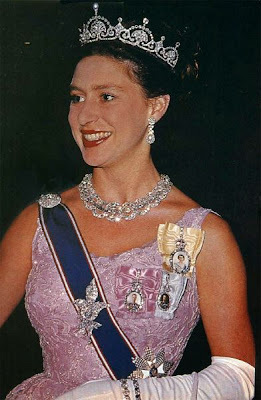 Princess Margaret at this point was no longer "main line" and already had use of many historic pieces as a young woman, therefore instead of something leaving the core collection the decision was made to buy her a tiara. Thus enters the Poltimore Tiara. The tiara is a Victorian piece by the then court jeweler Garrard dating to the 1870s. You can read more about its history here as it was sold at Christie's for a whopping $1.7M along with the rest of Princess Margaret's estate in 2006. 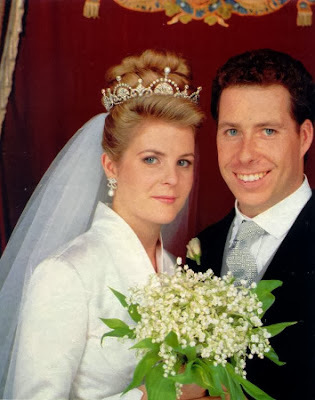 Similarly, when Queen Elizabeth's son, Prince Andrew, wed Sarah Ferguson in 1986 the decision was made to purchase a tiara rather than have one leave the core collection. Thus enters the York Diamond Tiara. Again the Queen purchased a Garrard piece, this time a tiara with scrolling foliage surmounted by a brilliant cut diamond. 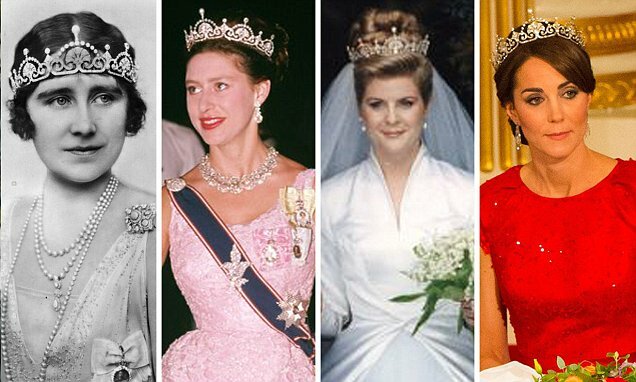 The tiara was a fixture in Sarah's brief career as a royal and was last seen publicly in 2001. 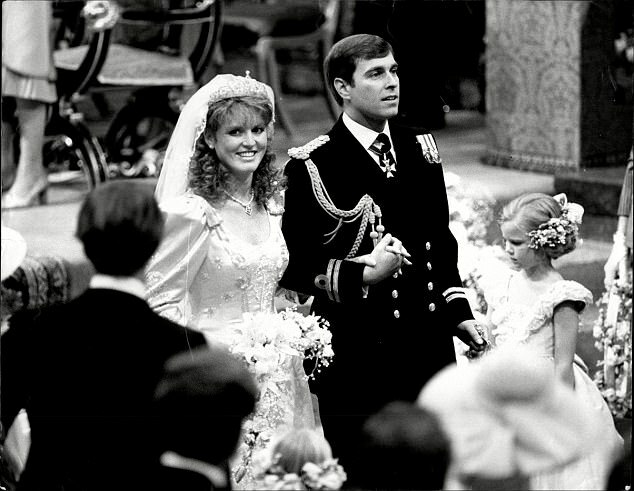 Perhaps we shall see it again when her daughter, Princess Eugenie, weds later this fall. The Queen could also choose to adapt a minor historic piece as a gift or lifetime loan as she did when her son Prince Edward wed Sophie Rhys-Jones (later Countess of Wessex) in the summer of 1999. Thus enters the Wessex Tiara. 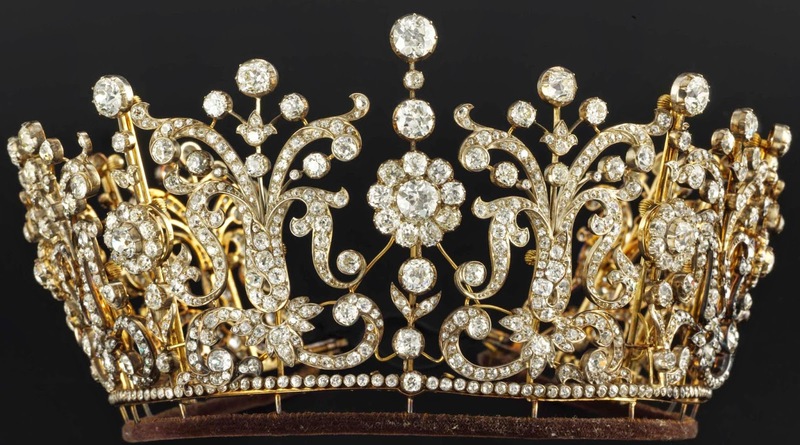 The Tiara itself is comprised of four scrolling elements (three with anthemions) cobbled onto a golden frame. It has height and thus impact but has always seemed a bit awkward in my humble opinion. At the time of the marriage its origins were unknown, but that mystery has been solved. As it turns out, the four ornaments were from Queen Elizabeth's personal collection and were once part of Queen Victoria's "Regal Circlet" dating back to 1850s. Unfortunately for us the circlet was unmounted in the 1930s but its frame survives in the Museum of London. Now bear with me, it is hard to see where this all fits in but if you examine the rest of the diadem's box you see resting spots for the anthemion ornaments which could have been swapped out for the other elements on the circlet. As you can see, considerable effort was extended for a limited return, however the provenance does make for an interesting story. It is my feeling that the Queen will purchase a piece for Miss Markle which would fit the established trend laid out above. 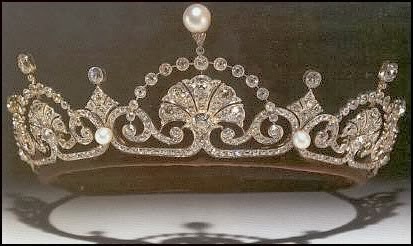 But, if she were to choose a historic piece I think the Strathmore Rose Tiara would be very fitting. The Strathmore was given to the late Queen Mother by her parents upon the occasion of her marriage to Prince Albert on April 26, 1923. It consists of a band of foliage surmounted by five pave diamond roses. 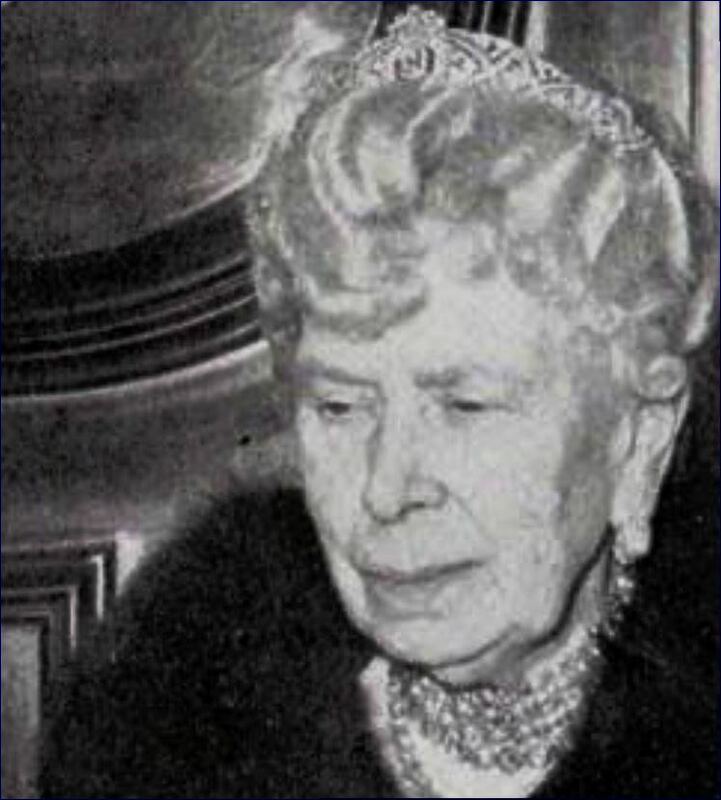 The tiara was in fairly active use while the Queen Mother was Duchess of York but receded into the background when she became Queen. It is believed to have passed to the present monarch when the Queen mother died in 2002. It hasn't been in use in decades but its survival is known from fairly recent color photographs. It would be a fitting choice for Miss Markle as it is youthful, romantic, historic, and hasn't been associated with another royal since the first part of the 20th century. For other historic outliers not in present use consult my previous post about the wedding of the Duchess of Cambridge but my instinct is that a tiara will be purchased. At any rate we will know very soon. Hello dear readers. 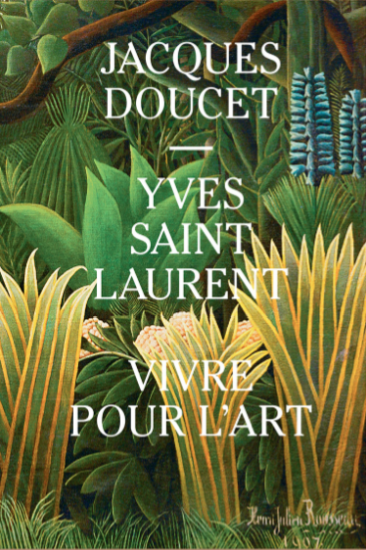 This post comes some ten days after my return from Paris where I quite luckily took in this exhibition at the Fondation Pierre Berge - Yves Saint Laurent. Long time readers are more than familiar with my posts and mini obsession with the collecting prowess of Jacques Doucet. This exhibition made links between the two couturiers and their voracious collecting habits that were largely against the grain and were testaments to their forward thinking visions. I came across the press release for the show some months ago and it appeared to highlight about twenty works and I thought it would be a fairly modest yet interesting showing. I was pleasantly surprised by what the Fondation PB-YSL was able to achieve. 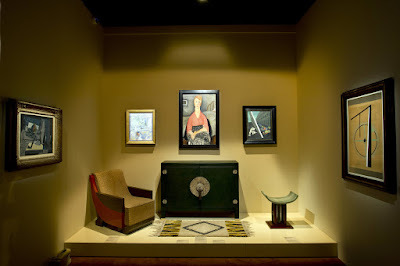 The exhibition was able to reunite an impressive amount of material from Jacques Doucet's "Studio" collection, culled from public and private institutions across the globe. Turning every corner within the galleries was truly a jaw dropping experience. 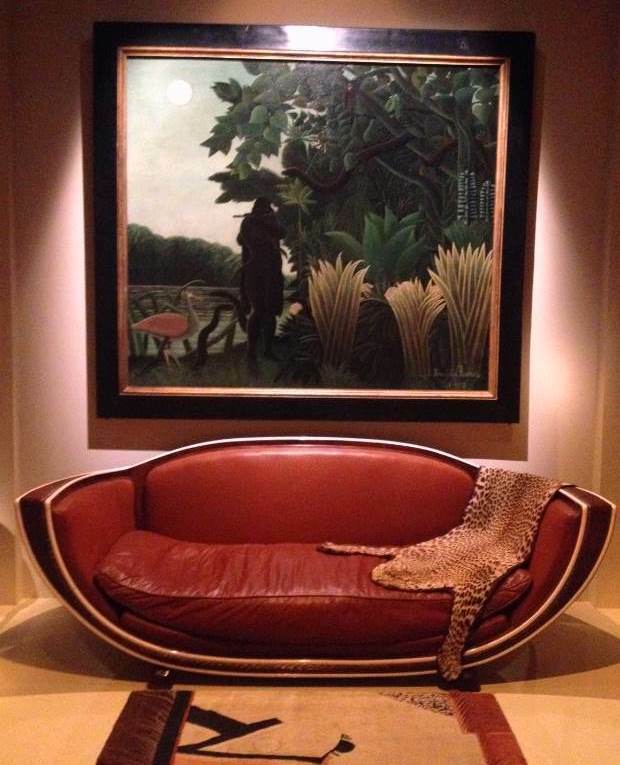 I was especially struck by Marcel Coard's "Africaniste" sofa from the Virginia Museum of Fine Arts being reunited with Henri Rousseau's canvas "The Snake Charmer" lent by the Musee D'Orsay in Paris. Moments like this are truly breathtaking, when you see pieces separated by time and circumstance reunited with the original collector's vision in mind. 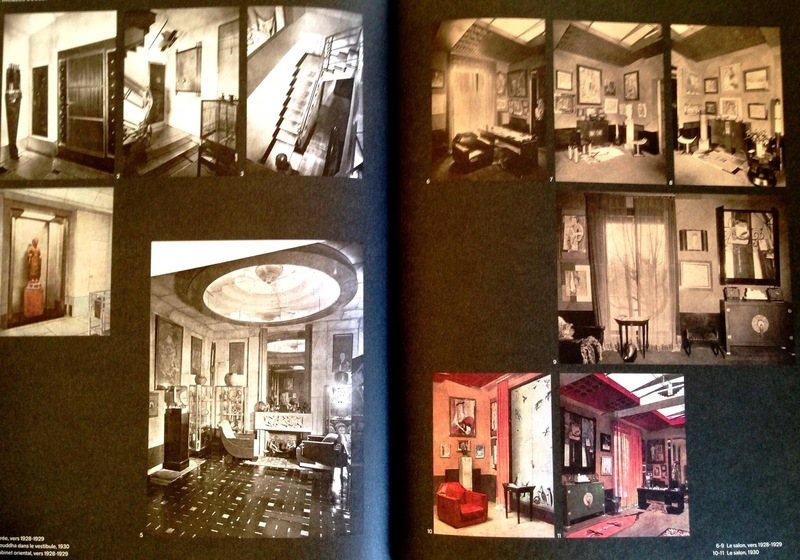 Unfortunately, the exhibition closes today, but the exhibition catalogue is exceptional. Every single piece is documented and illustrated. There are also a number of essays weaving a thread between Doucet and YSL and their overlapping collections. 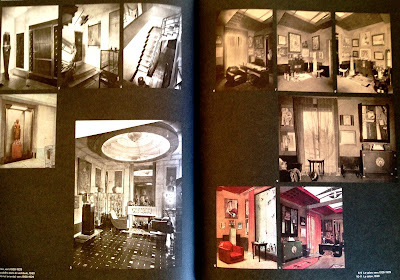 I was particularly grateful for the number of previously unpublished period images that give one a better sense of the layout of Doucet's "Studio" and its contents. Around every corner was an object that I had never seen in its original context...but I digress. I have plenty of material to pour over for the time being...until next time I leave you with this clip of the exhibition presented by curator Jerome Neutres--AR. Hello Dear Readers. It has been far too long since I have last written. 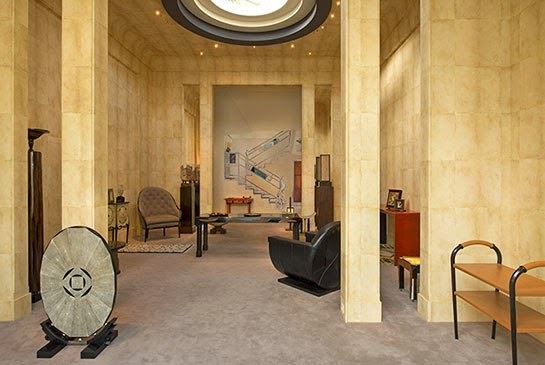 The New York 20th century design sales are happening this week and between Sotheby's, Christie's and Bonham's it will prove to be a stellar showing. Christie's in particular is offering many exceedingly rare works by my perennial favorite Armand-Albert Rateau. Besides offering an iconic low table and ashtray they have this exquisite perpetual calendar model that I had never seen in the flesh. But I digress... 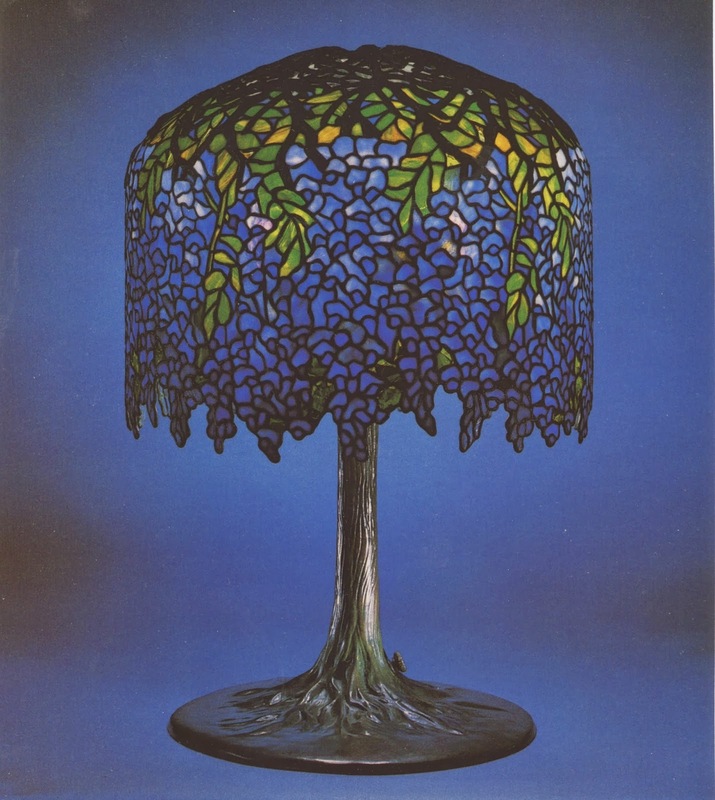 When Christie's published their design catalogues just prior to the Thanksgiving holiday lot 336 stopped me in my tracks. In a previous post regarding viking revival furniture I wrote about another example of this chair model that was then a recent acquisition of the Musee d'Orsay in Paris. 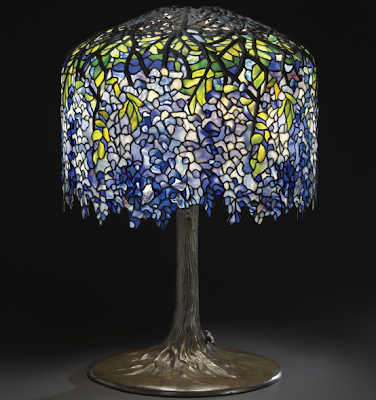 At that point the model was attributed to Tiffany Studios due to the fact that very closely related examples were part of the interior decoration of the Rembrandt Room within the Havemeyer Mansion, a celebrated Tiffany Studios commission. (The Havemeyer examples are of slightly grander proportion and have variations in the carving notably to the highly realized orbs on the arm posts). Some time after I published that post a follower contacted me to assert that the chair from Musee d'Orsay had received an updated attribution. The shift is due to the uncovering of a period Art Journal article reviewing the 1900 Paris Exposition Universelle. 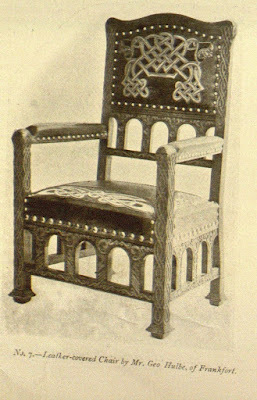 It would appear that a German leather craftsman and furniture maker Georg Hulbe exhibited chairs of the same design. The Christie's and Orsay examples visually relate to others offered at auction in the past decade (here, here, here, and here) and appear to be in-line with the period photograph attributing the model to Hulbe. The Musee d'Orsay has updated their online catalogue to vaguely note Georg Hulbe as the author (designer?) 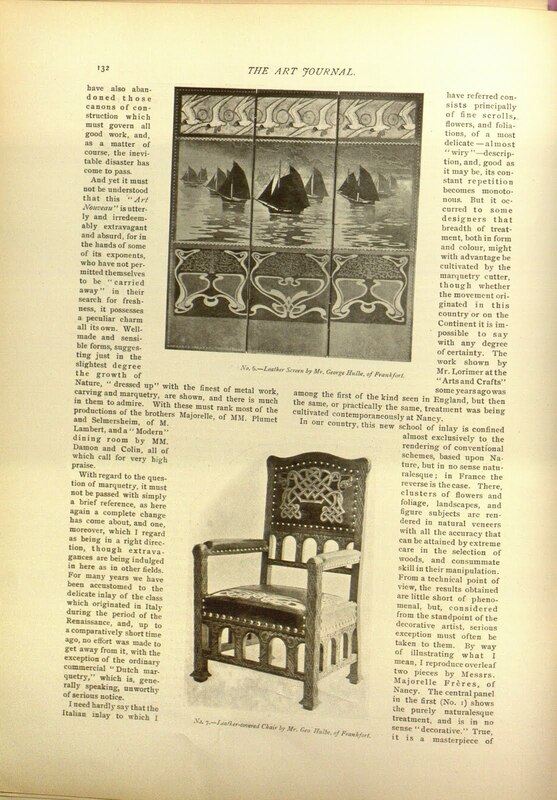 and Tiffany Studios as the maker of their chair. It is clear that more research needs to be done as countless scenarios are possible. 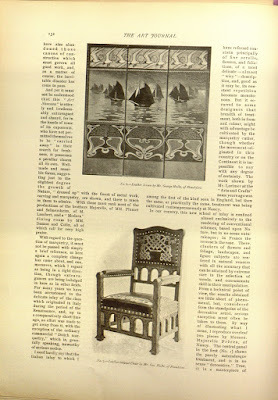 The Havemeyer examples could be the work of Georg Hulbe sub-contracting for Tiffany Studios or they could merely be Tiffany Studios executing Hulbe's design (or vice-versa). 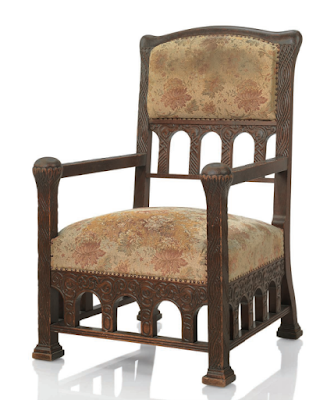 It is also a reasonable hypothesis that examples of this armchair coming from old European collections may have precious little to do with Tiffany Studios whatsoever. Until then the jury is out. At the time of this posting Christie's has withdrawn the lot from their upcoming sale pending research. Hello Dear readers I have taken far to long to start posting once again but life does tend to get in the way. In preparation for the unfolding fall auction season I took time to look back at the spring season to take stock. 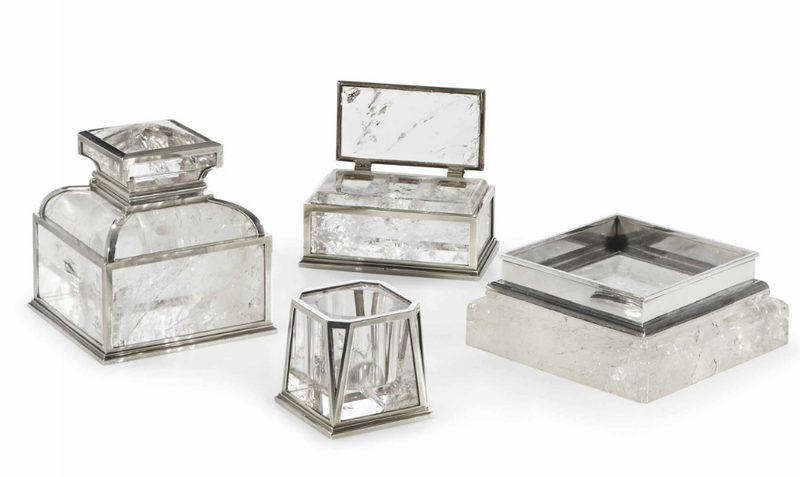 A reader tipped me off a few months ago that another rarity from Jacques Doucet's Studio St. James residence emerged at Christie's Paris May 20th, 2014 in the form of a rather smart silver and rock crystal desk set. The lot comprises an inkwell, pin tray, stamp box and paper clip pot. The winning bid of €37,500 is rather astonishing given that the set is not attributed to a known designer/maker and was offered on a pre-sale estimate of €10,000-12,000. The result shows the importance of a Doucet provenance. If you are not familiar with Jacques Doucet or his fabled collection see my previous posts here. 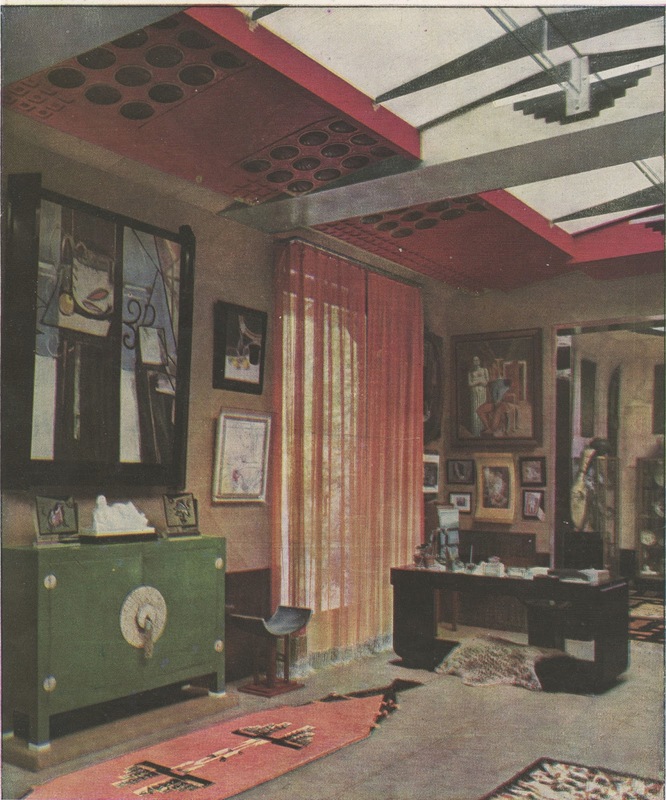 Christie's placed the date of the set to around 1929, the year Doucet died and when period images of his modernist studio home were published widely. 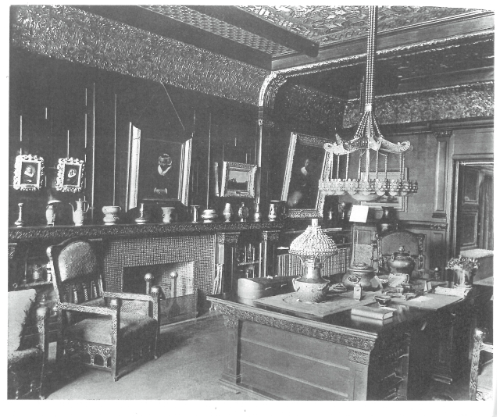 Looking at a period image of the studio the set indeed can be seen resting on the Pierre Legrain desk just outside of the "Oriental Cabinet". 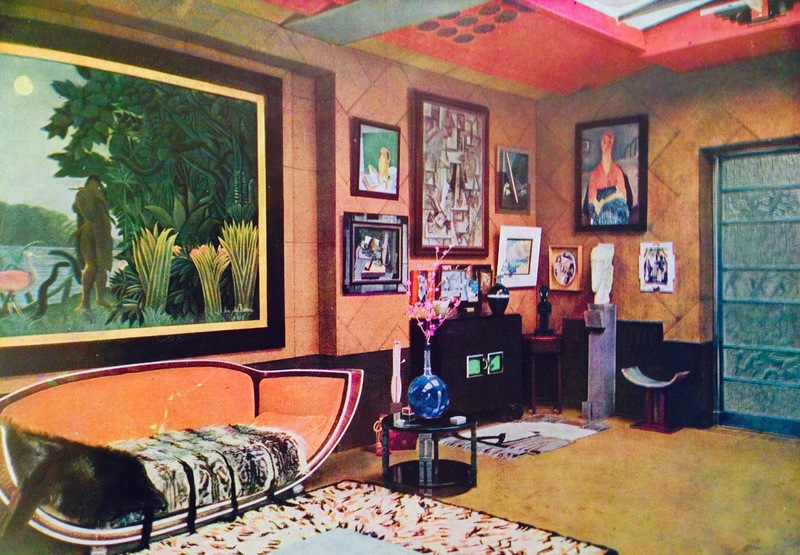 The set seen in-situ within Jacques Doucet's Studio Image: L'Illustration, 30 Mai 1930. 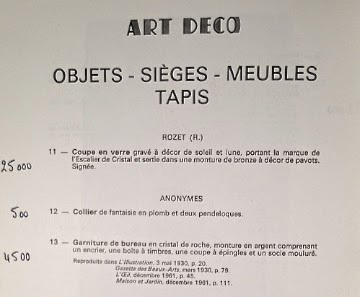 I would not date these items so late as they were present in the apartment Doucet acquired in 1912 on the avenue Bois de Boulogne. 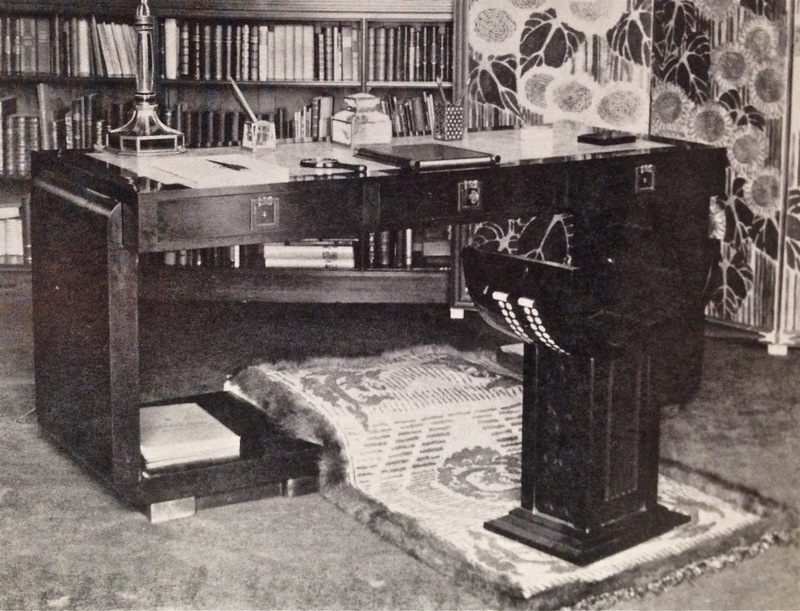 The image below from the early 1920s shows the desk set in the Bois de Boulogne residence placed on the same Pierre Legrain desk which itself was designed in 1920 and executed shortly thereafter. 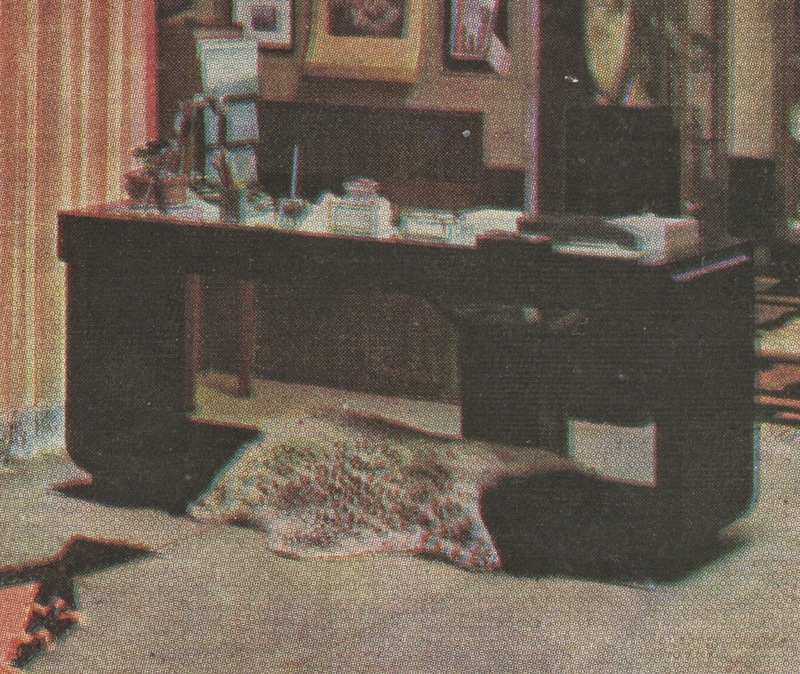 The desk set was one of a number of pieces that was not disbursed in the subsequent years immediately following Doucet's death. According to the Christie's catalogue the set was offered as lot 13 in his groundbreaking 1972 sale. The desk articles sold for a tidy 4500 francs where they were purchased by a Madame M., the present consignor to Christie's, which means they have had only two owners in nearly 100 years which only adds to their allure. 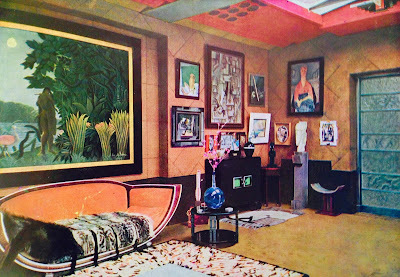 In putting together this post it came to my attention that Architectural Digest September 2014 issue published a short article about Doucet as a collector. It seems that the venerable Cheska Vallois dedicated her booth to Doucet's collecting genius at the 2014 Paris Biennale which closed today. 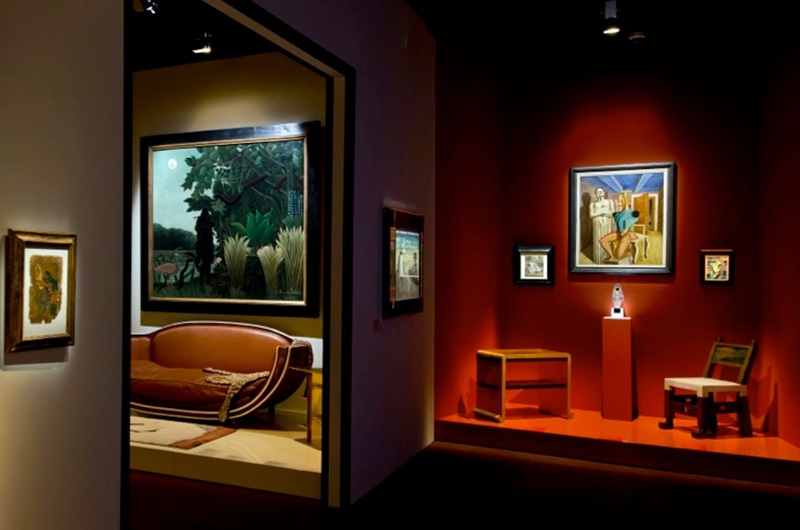 Reports point out that it is a mix of Doucet items and period works in the spirit of his collection. I am loving the printed scrim at the end of the installation showing the entry stairs to Doucet's Studio. Connaissance des art Decortatifs produced the following interview which highlights a few of the works presented. Hello Dear readers. 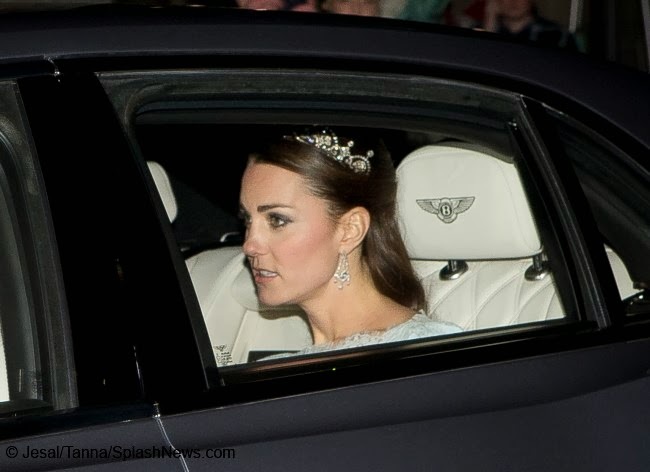 It has been quite some time since I have posted on this subject, but the Duchess of Cambridge has waited over three years for the privilege of attending another "tiara" event. On December 3rd the Duke and Duchess of Cambridge were guests of the Queen at Buckingham Palace for a diplomatic reception. Unfortunately, no formal state portraits have surfaced, just this partially obscured press image as she arrived with Prince William. While this tiara did not make my official list as a contender for her wedding, it was mentioned as an outlier because of its associations with Princess Margaret and recent use in another royal wedding. The tiara is known as the Papyrus Tiara and was fashioned from a necklace that was given to The Queen Mother on the occasion of her wedding to Prince Albert (George VI) in 1923. 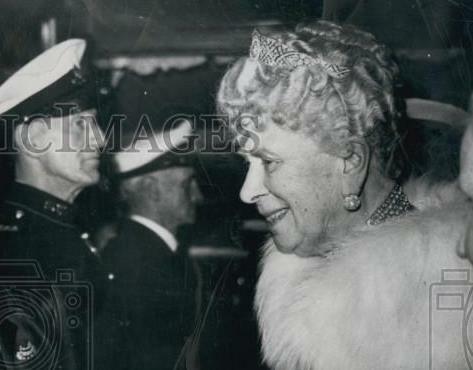 Evidently the queen mother presented the Papyrus Tiara to Princess Margaret prior to her wedding to Anthony Armstrong-Jones in 1960. 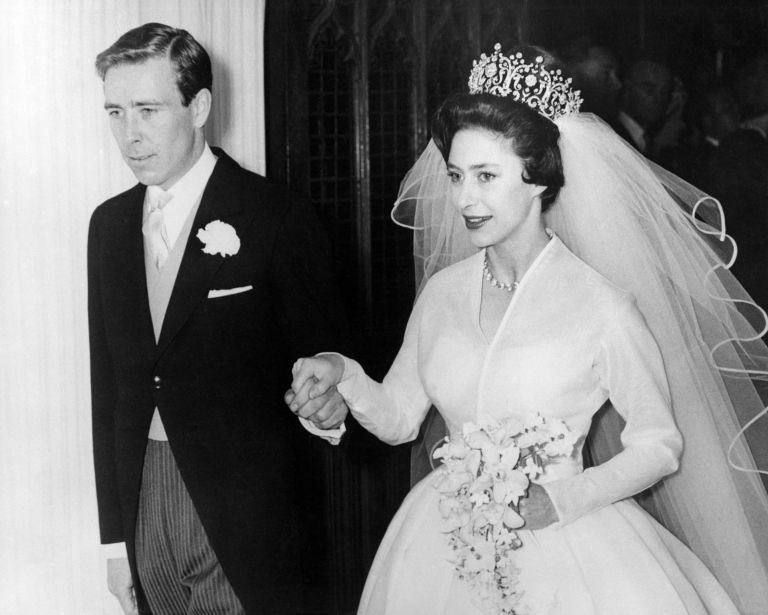 It became a mainstay for Princess Margaret over the years. 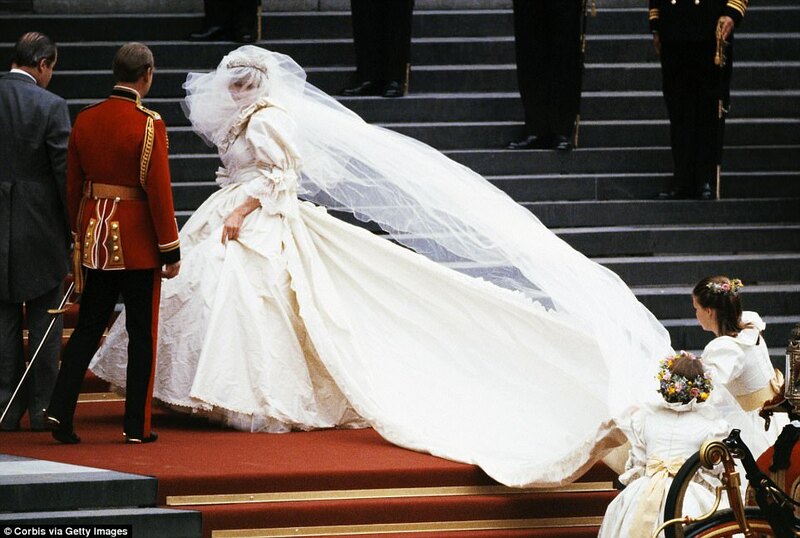 Princess Margaret in-turn loaned it to her future daugher-in-law Serena Stanhope for her wedding to Viscount David Linley in 1993. Just a quick note in the new year dear readers. The design auctions concluded just before the holidays and Sotheby's set a new world record for the Wisteria lamp model by Tiffany Studios. For an in-depth discussion of this design and its market, see my previous post here. 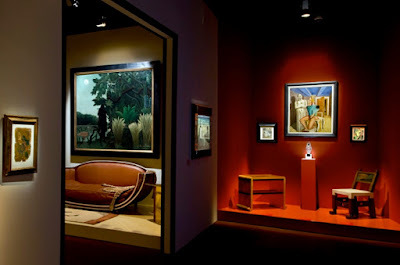 Sotheby's distinctive example reached a staggering $1,565,000 against an estimate of $600,000-800,000. The lamp had many things going for it. It was slightly deeper in tone in person and had a range of mottled turquoise glass along the lower border which gave an added sense of depth. The lamp also had the added benefit of an impeccable provenance. 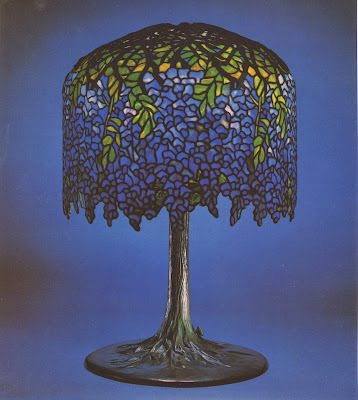 The lamp descended in the family of Baron Heinrich Thyssen-Bornemisza of Madrid who acquired the work around 1975. 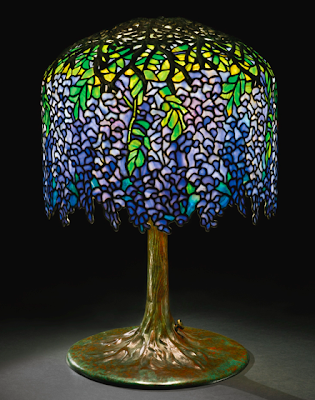 I have known dealers to ask this price range for the Wisteria model in a retail setting so it seems clear to me that lamp was very likely purchased by a private buyer, pushing the bidding into the retail realm. No details have surfaced yet, but I have a few ideas. The previous record was also set by Sotheby's for a Wisteria from the collection of John M. Fowler. This example was similarly saturated in tones and also had a range of deeply mottled glass. At the height of the pre-crash market it reached $881,000 against and estimate of $450,000-600,000. While the Wisteria is not the rarest of examples it is infinitely desirable to collectors and nuanced, saturated examples have always been the largest movers in the market. Throughout the 1970s auction records for the Wisteria climbed steadily from $16,250 for an example at Sotheby's London in 1971 to an example at Christie's in the fall of 1978 that moved the record to $52,800. However, before the close of the decade the example would be one of the very first tiffany lamps ever to exceed $100,000 at auction. The Wisteria in question came from the collection of Florida real estate magnates Eugene and Eleanor Gluck offered at Christie's in February of 1979. For insight on the Gluck sale see my previous post here. The period press described the Gluck's Wisteria as the best that had been seen at market achieving $132,000. The catalogue image above seem's a bit dark but it appears to be a mottled example with greenish turquoise glass used in the lower register to articulate the blooms. If this example were to hit the market today it would very likely exceed the newly established world record. We shall wait and see what the future auction seasons bring us. Until next time--AR. Art History BA, Design History MA, trained at Sotheby's, molded at Christies's, easily distracted by shiny objects. 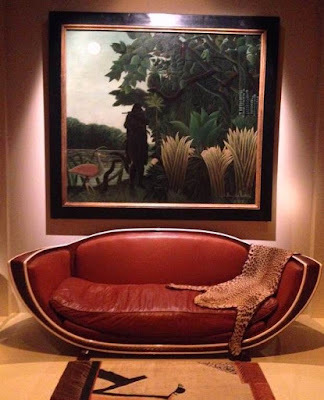 The purpose of this blog is to provide insight and demystification to the often esoteric world of decorative art and design.